Many adults considering straightening their teeth understandably prefer to do so discreetly. However, there seems to be some confusion between two of the most popular choices – Invisalign and Clear Braces. This isn’t surprising because if you’ve searched online then you’ve probably discovered that Invisalign tends to crop up in the search results for clear braces. 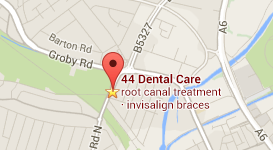 Here at 44 Dental, we’re often asked if they’re one and the same thing. In fact, they’re two options which treat different dental problems according to the individual’s case and the severity of the problem. We’ve put together 7 differences which hopefully will help you decide which is best for you. First of all, though, let’s run through the basics of each option to help you identify them more easily. Invisalign – Invisalign is a treatment which uses a series of clear plastic aligners to move the teeth into their correct position. The aligners are worn for a minimum of 22 hours a day and are changed every one to two weeks for the next set in the series. By the time you reach the last set of aligners, your teeth should have reached their desired location. Clear braces – Clear braces are essentially the same as metal braces with the difference being that the brackets are made from ceramic, which can be made transparent for a ‘clear’ look or matched to the colour of your tooth enamel so that they blend in seamlessly with your teeth. The brackets are joined together with an archwire which puts pressure on the teeth to move them. Adjustments are made roughly every 6 weeks. Invisalign is less visible – The big selling point of Invisalign for many patients is the fact that the transparent aligners fit over the teeth like a mouthguard and are barely visible to others. While clear braces are designed to blend in with a person’s teeth, the brackets are more obvious than the aligners. Clear braces can treat more complex cases – Invisalign can treat a wide range of cases provided they’re not too severe. For instance, they can treat crooked teeth, gapped teeth, and over and underbites. Clear braces can treat all of the same dental problems that Invisalign handles but in addition, they can treat very crooked teeth, malocclusions, crossbites, and various other jaw and teeth problems. Clear braces require less adjustment – Clear braces are adjusted every 4 to 6 weeks whereas Invisalign trays are changed at least every 2 weeks for the next corrective set. However, most dentists will provide you with the first few sets of aligners so you won’t need to visit the dentist every time your aligners need changing. Clear braces may irritate your soft tissues – Although you’ll probably get used to how they feel, clear braces can feel a little rough and may irritate your cheeks and lips. Aligners are made from softer materials and with no wires, they’re more comfortable to wear. Ceramic braces can break – Ceramic (clear) braces are more brittle in nature than Invisalign and are susceptible to chipping or breaking. Invisalign trays can be worn even if a small crack appears until they’re due to be replaced. Your teeth can stain with clear braces – While it’s not the ceramic brackets that stain your teeth, if you eat a lot of ‘coloured foods’ like curry or you smoke, it’s possible that the elastic wires will stain and these, in turn, will stain your teeth. If you’ve decided it’s about time you corrected your smile, then we can help. We’re an Invisalign provider and can examine your teeth and discuss your best braces options depending on your dental needs, budget, and lifestyle. 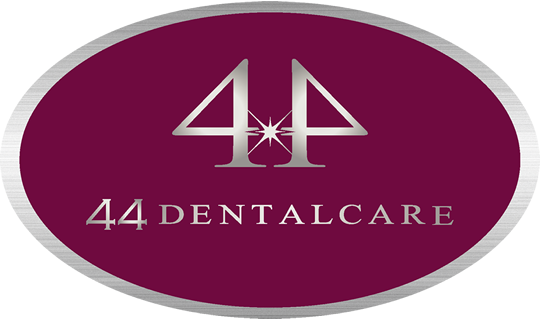 Why not call 44 Dental today on 0116 251 9647 to book your braces consultation.